Good quality and the comfortable pillow are necessary for good night’s sleep. 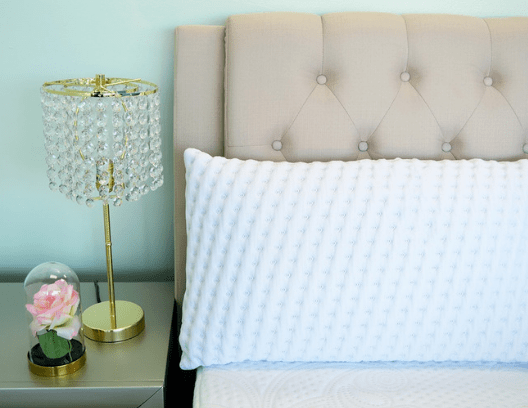 Choosing the right pillow that fit your sleeping requirements can be a difficult task. In recent years, there has been a rise in the demand for organic and natural pillows due to their multiple benefits. But before we plunge into details of best natural pillows, let us explain what organic pillows are. 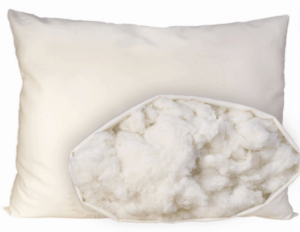 Organic pillows are made up of 100% natural organic materials such as organic wool, cotton or buckwheat etc. Some of the best latex pillows may use 100% natural latex material which gives a wonderful feel and comfort. Organic pillows are not just eco-friendly but have many health benefits which make them the best choice for relaxing sleep. Conventional pillows are generally composed of synthetic materials or blend which include many chemicals. The most commonly used synthetic material for making pillows is polyester. This synthetic material is harmful to the health as it is made up of toxic chemicals. It prevents the circulation of air and causes absorption of chemicals by your skin. It should not be in your bed! Organic pillows, on the other hand, are sustainable, environment-friendly and are not hazardous to your health. Keeping in view, the health benefits of natural organic pillows, we have tested, tried and slept on various organic pillows. Our team simply loved sleeping on these best natural pillows which are non-toxic, environment-friendly and are good for your health. These are free of dangerous chemicals and fire retardant toxins. We have listed the best organic pillows by different companies that provide organic bedding made of natural materials. Our selection includes environment-friendly 100% natural latex pillows, natural memory foam pillows, and organic fiber pillows. These pillows do not have any sort of harmful chemicals and bad fire retardants that are likely to cause harm to your health. Our review includes the six best natural pillows which will help you to decide the suitable organic pillow according to your sleep position and requirements. These companies offer a range of organic pillows online which removes the extra costs added to the pillow price due to a middleman. They also serve and support various charities as well as philanthropies to give back to society. These pillows are made to give you luxury, comfort and healthy experience in the long-run. Our team has tried their best to provide you with an honest opinion which is transparent and unbiased. We genuinely care about your health and promote healthy living. Choose from these 6 best natural pillows in accordance with your sleeping needs to enjoy comfortable and healthy sleep. Sweet Zzz Natural Pillow is a natural latex pillow which is made in the USA by a famous company Sweet Zzz. It is an all natural pillow that has received class 1 certification from OEKO-TEX. It is the highest standard of certification that can be given to any pillow. It’s also safe for use by babies and toddlers. This pillow is an eco-friendly product that is hypoallergenic, very durable and breathable. The material for its manufacturing is sourced from natural rubber trees which are not processed by harmful chemicals. It is completely renewable. 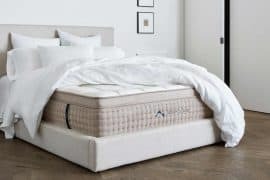 With 100% Talalay latex, it perfectly adjusts to the shape of your body, helping you get better quality and comfortable sleep. When you get up in the morning you feel relaxed and fresh, unlike other pillows. The pillow comes in two different firmness levels, which are plush and firm. It means that you can choose between 2 firmness levels according to your sleeping requirements. It comes with a 100 nights free-trial so that you can experience its features and your body adjusts to it. The company also provides a 3-year warranty to ensure that you make a risk-free investment in the Sweet Zzz Natural Pillow. Our experience of using Talalay latex pillow instead of regular memory foam pillow has been really good. Latex is a 100% natural material extracted from rubber trees in the US while memory foam pillow is 100% man-made made of synthetic chemical based materials. It molds better to the shape of your body as compared to memory foam pillows. It gives a much softer and comfortable feel with a better dissipation of heat and water than the memory foam pillow. The Sweet Zzz Natural Pillow comes with 100% organic cotton covering which is soft, thick and comfortable. It has a zipped enclosure, which makes it easy to remove. You can wash it conveniently when required. We found that the organic cotton covering gives a plush feel against the face. It is because organic cotton is breathable, which wicks away moisture to help keep your body cool and dry during sleep. The natural cotton also has the hypoallergenic and antimicrobial qualities so if you suffer from allergies Sweet Zzz Natural Pillow is good for you. The filling inside the Sweet Zzz Natural Pillow is made of 100% natural latex obtained from rubber trees in the USA. The cells of Talalay are larger in size which allows the air to easily pass through them. 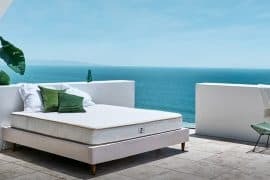 The process of Talalay makes it highly breathable. It is a hypoallergenic, environment-friendly and very durable material. The filling material is not processed through toxic chemicals, which makes it completely renewable. This pillow has received class 1 certification from Oeko-Tex which is highest quality ranking possible for pillows. The Sweet Zzz Natural Pillow is available with 2 firmness levels; plush and firm. This allows you to choose between the two firmness levels. The choice of firmness depends on your sleeping preferences and position. The plush pillow is suitable for stomach sleepers while the firm pillow is suitable for back and side sleepers. It adjusts to your neck and head contours, providing you with optimal comfort so that you get up fresh and active in the morning. What is Unique About The Natural Pillow? The unique qualities of Sweet Zzz Natural Pillow lies in its construction and cover. It is a combination of natural Talalay latex and 100% organic cotton removable covering. These features enhance its appeal and provide you with durable support. According to our findings, it is comfortable, hypoallergenic, and breathable and adjusts to the neck and shoulder contours, easily. It is free of harmful chemicals and is even fit for babies and toddlers due to its all-natural construction. OMI Organic Cotton Pillow is a certified organic product from the renowned company OMI. It is a good option for people who do not want to use organic pillows made from latex or wool. It gives a nearly similar feeling as your traditional pillow, but it is available in three weights: light, medium and heavy. 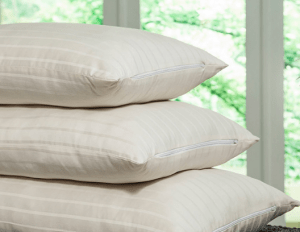 If you are seeking an all organic pillow, which provides firm support while sleeping then it is a wise decision to choose OMI Organic Cotton Pillow. But you need to keep in mind that this pillow has no return warranty. 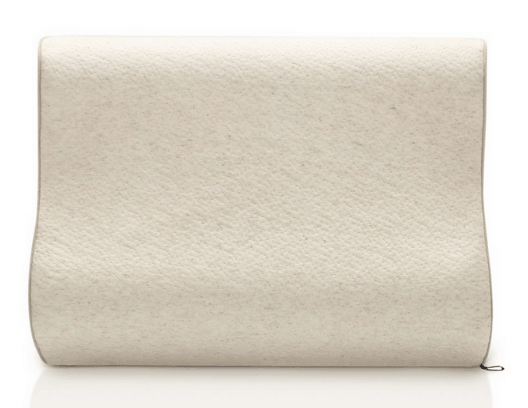 The OMI organic cotton pillow comes with the 100% organic cotton sateen covering with a zipper enclosure. It gives the superior feel of luxury and comfort. Those who suffer from allergies can choose this pillow as it is hypoallergenic. The organic cotton is soft and wicks away moisture from your skin. 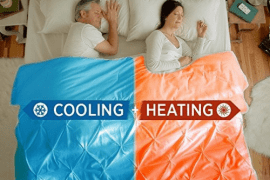 It allows the flow of air through it which keeps your body cool and dry while sleeping. Our team tried it and found it comforting and helpful in promoting sound sleep. The filling of this pillow is certified 100% organic cotton which is free from harmful chemicals, eco-friendly and hypoallergenic. 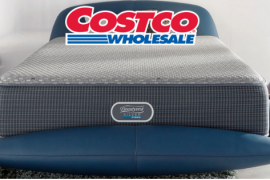 It offers superior support for your neck and back during sleep. Remember that the organic cotton filling does not remain the same over the years. It compresses almost half during the pillow’s lifetime so purchase the pillow which suits your comfort level and height requirements. It comes in three different filling weights which include soft, medium and firm. You can choose the one according to your sleeping requirements. However, it only offers a single surface choice to users. If you are a back or side sleeper, then soft or medium filling would be suitable for you. If you are a stomach sleeper, then you should buy a softer version of this pillow. It is durable, resilient and soft and can withstand many years of use. What is Unique About This Pillow? The OMI all organic cotton pillow is 100% organic in terms of its filling and covering. It provides the traditional feel of memory foam pillows that most people are used to along with the durability, luxury, firmness, and comfort of organic cotton. PlushBeds Natural Wool Pillow is an all-wool natural pillow, which is made of organically sourced wool directly from sheep wool. These wool supplying sheep are humanely treated at every step of wool growing and gathering process. It is a GOTS certified product. It is hand-stuffed which ensures that you get just the suitable level of support for a relaxing sleep. The natural organic wool has several benefits. It is free from harmful chemicals, which can cause allergic reactions. Wool is breathable and helps regulate body temperature. It allows the flow of air through it, which keeps your body cool and dry during the night. As it’s made from all natural wool, it keeps you relaxed and fresh at any temperature all throughout the year. You can enjoy the softness and luxurious feel of all natural wool. Remember that the company does not provide a return warranty on the purchase of this wool pillow. The covering is made up of 100% natural organic wool which is hypoallergenic. It prevents the growth of germs and dust mites that are harmful to the skin. The organic wool covering prevents overheating of your body and keeps it cushioned and relaxed throughout the night. This pillow has all natural 100% pure wool filling that is sourced from organically raised sheep. It is hand-filled to ensure a right level of comfort and support in each pillow size. It comes with a zipped enclosure so you can adjust the filling as per your needs. This all wool pillow is available in a single level of firmness however you can choose between different sizes. It only has a firm support level which makes it suitable for back and side sleepers. So you should be careful while buying this pillow and consider your sleeping position. This pillow provides the feeling of a traditional pillow that most people are used to. Its firmness makes it right for back and side sleepers. OMI Wool-Wrapped Organic Buckwheat-Hull Pillow is a durable dual-filled pillow. It is filled with organic eco-friendly wool in the outer chamber. The inside chamber is filled with organic buckwheat-hull. It comes with a zipper which makes it easy for users to customize the pillow according to their sleeping preferences. Although its price is a bit higher, it is a truly unique pillow to use. It is hand-made pillow manufactured in the USA. The wool wrapped organic natural pillow has wool covering which gives it a luxurious and plush feel. Wool is naturally soft, breathable and hypoallergenic. It allows the easy flow of air through it. This means that it wicks away the moisture from your skin surface and regulates your body temperature. You can enjoy a sound and relaxing sleep with this organic pillow. This pillow comes with two different fillings. It is filled with organic wool in the outside chamber while natural buckwheat-hull filling is inside. The zipper closure allows you to see and adjust the buckwheat filling. If you like a soft pillow with soft to medium support then you can remove the buckwheat filling inside. If you want to have a relatively firm surface to sleep on then you can use it without adjusting its filling. The buckwheat provides support to your head, shoulders and neck contours for different sleeping positions. As wool is hypoallergenic, it is the right choice for people who have allergies. 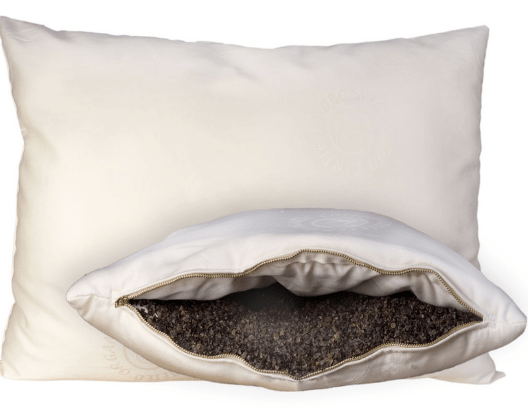 This pillow offers just one level of firmness, but you can adjust it to your requirements by adjusting its buckwheat filling. It provides a medium-firm level of support with wool and buckwheat filling. If you are looking for a soft firm support level then remove some of its buckwheat fillings and enjoy the plush feel of wool. This pillow has a unique construction with wool on the outside and buckwheat filled inside the chamber. The firmness and support can be adjusted to your requirements by removing some of the buckwheat through the zipper enclosure. It is a durable and eco-friendly pillow. Avocado Green Pillow (Kapok Choice) is another good organic pillow which you can use for a restful sleep. This non-toxic natural pillow is generously filled with organic Kapok filling and shredded ribbons of latex rubber foam, encased in an organic covering which is GOTS- Certified. It gives you a cool, luxurious and airy experience while sleeping. It is suitable for almost all sleeping positions due to the support and resilience it provides to your neck and head. It easily adjusts to your neck, head, and back contours, giving you relaxed and sound sleep. The Avocado Green Pillow has a combination covering with organic cotton on the outside and a light layer of polyester stretch 4-way knit on the inside. It has 100% certified premium organic cotton covering. Natural cotton is a proven light, soft and breathable fabric. It keeps your body cool by allowing air to easily flow through it. The cotton wicks away moisture to regulate your body’s temperature. This pillow has received the well-known OEKO-TEX Organic Standard 100 Class 1 certification for its highest quality compliance standards. The combination of organic cotton and polyester enhances the durability and lushness of the covering. It has a zipped enclosure which allows you to adjust the filling as per your sleeping requirements. The pillow is filled with two types of fillings in equal quantities. One is 100% natural shredded latex and other is Kapok derived from natural tree fibers. Both these fillings have received ECO- INSTITUT certification. 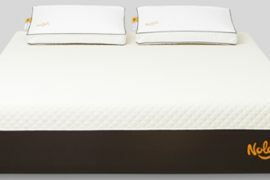 The filling materials are made from sustainable and organic resources, which help regulate the sleeping temperature. The shredded latex ribbons are known for providing resilience and high-performance filling which provides durability with instant reaction to pressure. The fibers are extracted from the Ceiba tree, which is a great organic alternative to synthetic materials. It makes the pillow hypoallergenic, toxin-free and biodegradable. The pillow is designed to adjust to all sleeping positions. As the pillow is over-stuffed, you can adjust it to your loft requirements and preferences by removing some of the fillings. The pillow provides suitable pressure relief for all sleeping positions as we tried it in different sleeping positions. It is due to the pliable and supportive filling material. The pillow provides gentle support to your head and back while adjusting itself to any sleeping position you adopt during sleep. 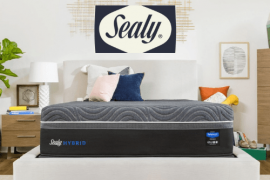 It has not been assigned any specific firmness rating because the level of firmness is adjustable, but when it has full stuffing its firmness feel like medium to firm. The uniqueness of this certified organic pillow lies in its covering and the two different types of fillings packed in a single pillow; latex and kapok. It is all natural and free of harmful chemicals, providing you with eco and health-friendly comfort while sleeping. Its firmness is adjustable which means that you need not to buy any extra pillow if you want to switch from a firm to soft pillow. The Avocado pillow allows you care-free maintenance. You can easily spot clean the surface with a damp cloth and keep it outside to naturally air dry in a sunny and airy spot. It is also washable with cool water and tumbles dry on cool temperature. If you are looking for a firmer and eco-friendly pillow in the memory foam choice, then the Tea Leaf Contour Pillow fits your selection. It is an eco-friendly memory foam pillow, which uses tea leaf in its bio-foam memory foam filling. It is an exclusively designed pillow which cradles your head due to its unique shape. It has two mounds that provide support to your neck. The higher mound is suitable for taller people which support their neck while a smaller mound is suitable for short people. You can experiment with it to find the ideal solution to fit your sleeping position and requirements. The specially contoured pillow shape provides you with a pressure-free and floating feel, which even enables you to sleep in just one sleeping position throughout the night. Keetsa has adopted a distinctive approach in creating this pillow. The company has used EverGreen tea extracts for conditioning this pillow instead of using artificial deodorants and replaced the part of petroleum used for making memory foam with castor bean oil. This implies that this pillow provides you with a healthier and better alternative to traditional memory foam pillow. The Tea Leaf Contour Pillow comes with soft hemp blended fabric covering. The covering is plush and breathable. It allows easy flow of air and ventilation to keep your head cool while sleeping. It regulates your body temperature for better sleep. It also has an inner covering that is made up of light cheesecloth which further adds to its breathability. The pillow comes with a bio-foam filling. It has sustainable memory foam filling which is made from a combination of natural and synthetic materials. A part of synthetic materials has been replaced with castor bean oil which has made it eco-friendly. The EverGreen tea extracts have been infused into the memory foam to provide longer-lasting and natural control over odor. 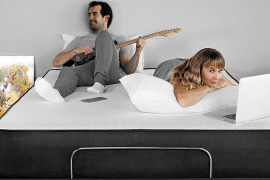 Due to the use of memory foam, it comes with just a single firmness option that is firm. It is well-suited to both side and back sleepers as they need support for the neck and spine. This pillow has two mounds which provide support to your neck and head while sleeping on your back and side. It aligns with your neck while keeping your spine in a straight position. The thickness is appropriate for both side and back sleepers. Unlike, other pillows mentioned in the list of 6 best pillows, this pillow is made up of biofoam memory foam. The material has been uniquely made to minimize the hazardous effects on your health. This contour pillow adjusts well to your side or back sleeping positions. As you have already read, the most commonly used materials in natural pillows are latex, organic cotton, natural wool, kapok, and bio-foam or eco-friendly memory foam. Organic pillows are safe for your health and are hypoallergenic and eco-friendly. These pillows are a healthy choice as they provide a high level of comfort to give you a relaxing sleep at night. Natural Latex is one of the popular organic materials which are now used for making natural organic pillows. Latex is extracted from rubber tree sap. It is an odor free and environment-friendly material. One of the key features of latex pillows is comfort. Since the latex used in their manufacturing is dense, it retains its shape and softness for years. Due to its elastic qualities, it easily adjusts to the contours of the neck and head, providing you comfortable and sound sleep. It is suitable for every sleeping position. Latex is free of microbes and mildew proof. It does not facilitate the growth of dust mites and other allergens, which makes it ideal for people suffering from allergies. The latex pillows are highly durable and last for many years as compared to cotton pillows. Due to their outstanding durability and comfort, these pillows are often rated high in user-satisfaction. These pillows retain their shape for over ten years, giving you optimal returns on your investment. Since is it already sterilized, it is easy to care for. You do not need to clean it often. You can spot clean it with damp cloth and soap when required. Natural cotton is another material that is frequently used in pillows for covering and filling. Natural organic cotton is a soft and luxurious material, which provides a comfortable and lush feel. It is also breathable and helps regulate your body temperature during sleep. The natural organic cotton is harvested without using harmful chemicals and pesticides. This makes organic cotton safe for health and it is eco-friendly. Organic cotton pillows are much softer than traditional pillows because no harmful chemicals have been used in their manufacturing. Sustainable and biodegradable: Natural cotton is sustainable and biodegradable, which makes it eco-friendly. Organic cotton has hypoallergenic qualities which make it suitable for people who have allergies. Organic cotton pillows filling can be conveniently used for babies and toddlers as they are made of 100% organic cotton, which has no health risks associated with it. So you can safely use natural cotton pillows for your little ones as well. Organic natural wool is a widely used material in pillows due to its amazing qualities. It is produced from organically raised sheep in organic farms. On these farms, no harmful pesticides, hormones or other chemicals are used to raise sheep, and these harmful chemicals are not present in their food and in wool shearing and processing. It is used for making pillow coverings as well as fillings. Organic wool provides support and comfort to your back, neck, and spine to promote quality and relaxed sleep. Organic wool is breathable, which means it allows air to pass through it. The wool absorbs moisture from your body and regulates temperature so that you stay cool while sleep. As organic wool is produced under strict organic quality controls, it is certified chemicals free which promotes healthy sleep. Organic wool has naturally had hypoallergenic qualities. As it absorbs moisture, it naturally inhibits the growth of molds, germs, and mildew. Dust mites cannot grow in wool; so, this makes it resistant to microbes and dust mites. Kapok is derived from the tropical Ceiba tree, which is found in Mexico. Kapok fibers are taken from its fruit, which is fluffy and has a silky touch. It is also referred to as silk cotton. This fiber is often considered an alternative to cotton, but is much softer and silkier than cotton. The Kapok filling is fluffy and bouncy. It adjusts back to its original bounce and fluff easily. Its filling may require fluffing for even distribution of fibers in the pillow. Kapok filling is clump-resistant as compared to wool. It keeps its shape after washing. You can use a tennis ball while drying to help maintain its shape. Eco-friendly and biodegradable: Kapok is an eco-friendly material and is not processed with harmful chemicals. It can be naturally biodegraded when it wears out. It has a silky soft feel and is much lighter in volume than cotton. This filling adjusts to your natural body contours and your sleep position. It provides support to your head, neck and back for a comfortable and quality sleep. Hypoallergenic: It is resistant to microbial growth and growth of mites because Kapok fibers are naturally moisture resistant. This prevents bacterial and fungal growth. 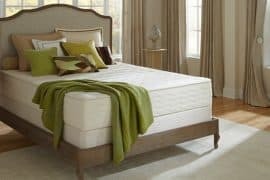 Conventional memory foam filling is not natural, but now few companies are manufacturing eco-friendly versions of memory foam for filling. This type of filling uses plant-based oils as a replacement for petroleum and produced under climate control conditions. It provides a firm level of support to your body. As memory foam is firmer than other types of filling, it gives support to your body and aligns your spine. 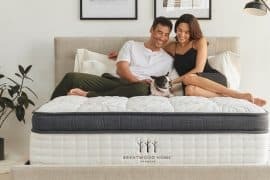 The memory foam filling is hypoallergenic. It can be comfortably used by people who have allergies. It is anti-microbial and anti-fungal and prevents the formation of dust mites. 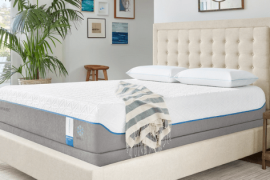 The open-cell technology in the latest bio-memory foam filling and allows easy flow of air which helps maintain a comfortable body temperature during sleep. Stress can keep you awake at night and trigger flare-ups of seasonal respiratory allergies. People who had more than one allergy flare-up reported higher levels of stress than those who didn’t have allergy symptoms, according to a study in the Annals of Allergy, Asthma, and Immunology. Therefore, it is important that you find ways to eliminate stress, such as practicing calming techniques like taking time to do activities you enjoy, deep breathing and meditating. 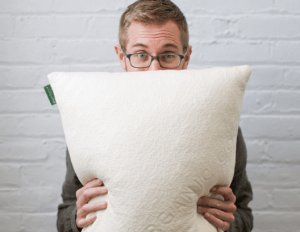 There are many options available in the market for the best organic pillows. We have tried and tested these six best natural pillows to help you decide the most suitable pillow in accordance with your personal preferences and sleep requirements. Using these pillows will not just help you improve the quality of your sleep, but will also have positive effects on your health and environment in the long term. You will definitely feel the difference after using any of these pillows for some time. Although organic pillows are a bit on the pricey side, these pillows will give you maximum returns on your investment due to their durability. Are Pillows Necessary? Can I Sleep With no Pillow at all? Pillows are not always necessary. A lot of stomach sleepers report not using a pillow at all. That being said, almost all side sleepers use a pillow. This means that it mostly depends on your sleep preference, your weight, and your shape. Pillows are there to there to make sure that your head, neck, and spine are in the correct form. Its always better to use a pillow protector and pillow cover as most pillows cannot be washed. Memory foam pillows, for example, will trap the water in and you’ll most likely have to throw them away if you wash them. Latex isn’t much different. What Are The Pillow Sizes? The main pillows sizes are standard, queen, and king sizes. 2 standard pillows will fit a full-size mattress. 2 queen size pillows will fit a queen size mattress and 2 king size pillows will fit a king or California king size mattress. As far as twin and twin xl, it better if they go with a single queen size pillow or a king size pillow as both fit a twin sized mattress. It’s usually better to change your pillow every two to three years as it will house a lot of dust mites and cause allergies. That being said, you could use a pillow protector where no dead skin or sweat gets to the pillow. This way you can use your pillow much longer while also reducing allergies and increase your overall sleep health. What Is the Best Pillow For a back Sleeper? Back sleepers generally tend to sleep better on a pillow that is medium in firmness and thickness. 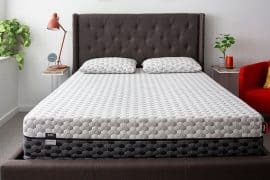 That’s because unlike side sleepers the gap between the mattress and the head of a back sleeper is much smaller and so a medium firmness and thickness is recommended. For those that switch between back and side but sleep mostly on their backs, a little firmer pillow would do the trick. Most stomach sleepers use a thin soft pillow because the gap between their head and the mattress is very small. A thick pillow might cause neck and back pain. Some stomach sleepers actually don’t use any pillows but they are the minority.